Beautiful chandelier fan instructions are not head on. Installed & happy with chandelier. 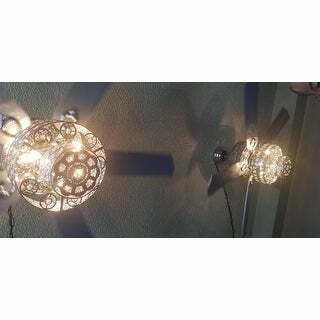 Home Accessories is offering a stately collection of ceiling fans that depart from the ordinary. 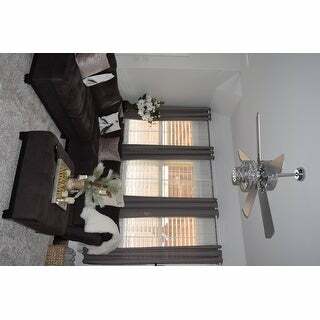 Beautiful metal work with high quality mechanical elements coalesce into an elegant lighted ceilng fan. The richly traditional design is meant to compliment any luxurious space. Cool your home with style. Dimensions 52.0 In. X 52.0 In. X 25.0 In. 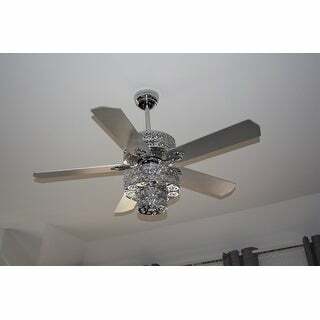 I purchased this ceiling fan as a surprise Holiday gift for my mother. It actually looks like a chandelier. It is very expensive looking and the quality is excellent! There are 3 tiers of lighting, which by using your remote control, you can change the lighting to numerous settings. The fan itself goes both counter clockwise and clockwise. The light bulbs are very easy to find and are very inexpensive. Mine were ... cents per bulb! The lighting as it hits the silver gives off beautiful gem type shades. The remote control is white, and very easy to use. The packing of this item is also EXCELLENT! It took less than 30 minutes to completely hang. My friend is an electrician and had it done in no time. Common sense coupled with very good instructions enclosed make it very easy to do. I highly recommend this to anyone. Very appropriate for any bedroom, living room, kitchen, or dining room!!! I have enclosed 3 photos that show the three different levels of lighting that you have to choose from. Quality is better than expected and the light patterns on the wall as the light goes through the cut outs and crystals is an added bonus. My only wish is that the fan and light would remember its last settings. When you turn off the switch you have to use the remote to turn back on the light and/or fan when you turn the switch back on. Maybe it is a result of how we wired the fan? This fan is so elegant. It is absolutely gorgeous. It is the perfect addition to any room. It gives off plenty of light. The silver of the blades is pearl. The Crystal's sparkle nicely. The remote is a great addition. 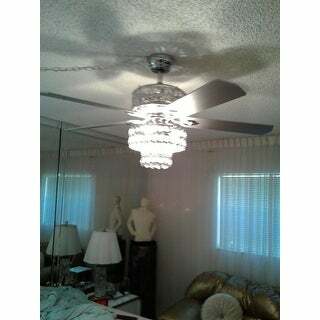 I received the Chandelier Ceiling Fan 7 days after placing the order. The fan needed some assembling which my husband and I put together. 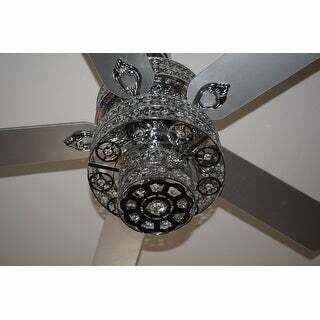 The fan looks really glamorous and I love the shiny silver color. The reason that I gave it a 4 stars and not 5 is because it didn't come with bulbs and the LED bulbs that I put in didn't give off as much light as I was hoping for. 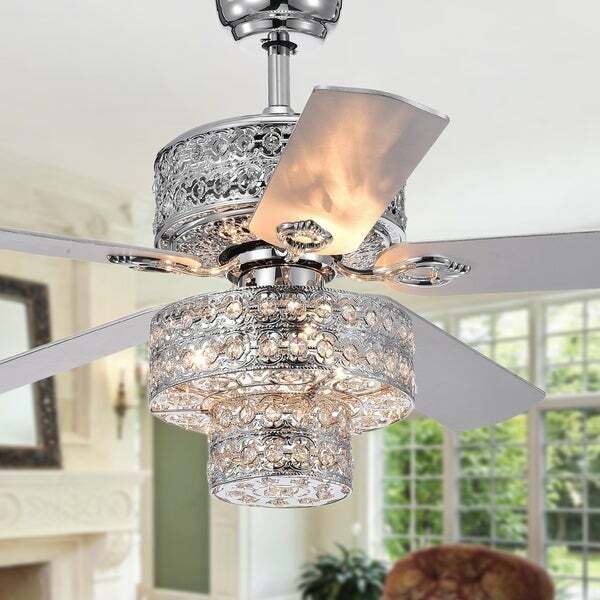 Overall, I really like the look of the chandelier fan and the remote control capability that lets you only turn on the top section, only the bottom part (below the fan blades) or both sections. It is a beautiful fan! Just not very user friendly to install, especially if you want to drop it any amount of length. It is made to sit flush with your ceiling. I had it professionally installed and the remote control module was faulty. Still waiting for the issue to be resolved before I send the installer out for a new module. One beautiful piece. This doesn’t come with lights. Need to purchase on your own. Silver blades add elegance and is perfect for my chrome/mirror decors. Only 4 star for difficulty to assemble. It only have a small cap cover for electrical and my hubby had a small room to move around his hands to figure out all the electricals . You need patience when installing this. Took us an hour or so to finally complete this tedious job. 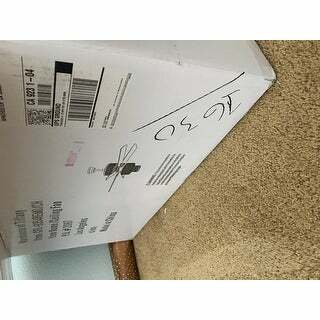 Overall the packaging, the item received, the quality made was perfect for the price. This is a very luxurious fan. It fits well in my Traquility Room. Excellent buy for the price. Love the features of 3 way lighting so you can decide the lighting brightness you like. The remote is a great feature and you can control the 3 Way lights with the switch as well. Love it!!!! Beautiful fan and light. The installation instructions could have been better. The control box can fit snugly in the ceiling bracket (right next to the ceiling wiring box) if you make sure to make your wire connections off to the side and not down the middle of the bracket. The light bulbs need to be fairly short to be able to fit I used LED bulbs, E12, 5W in a true white. However, I used what I had on hand for the base light and they are more yellow. I need to change them out since when both lights are on , one is yellow, the other bright white. Be sure to use the same bulbs in both light groups. It has very good air flow even on low and is quiet. I am happy with this fan. Beautiful and I was pleasantly surprised to see the gems on there which go with gems in my chairs. Very elegant. Will give my dining room the elegant touch it needs. 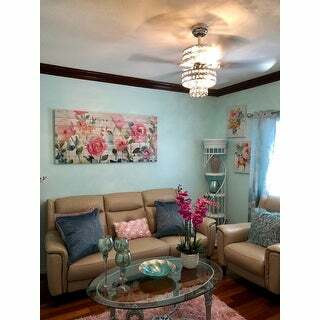 it is just beautiful and elegant perfect for the room its in. 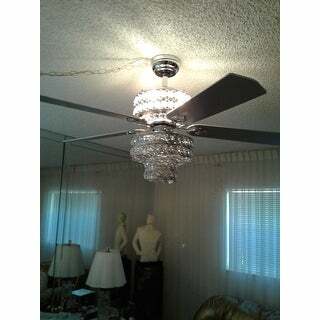 This fan is so elegant and dresses up my guest room. Very elegant and the perfect size for my teenage daughter's bedroom. 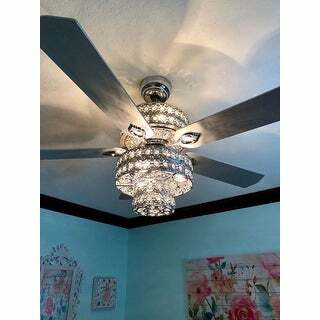 The ceiling fan is beautiful, however I paid my electrician to install it and we couldn't figure out why the fan wouldn't work without the light and vice versa. The instructions weren't good at all, especially considering the module had a wire that didn't belong so we couldn't figure out what to do. We finally watched a you tube video and my electrician decided to cut out one wire and it finally worked. I wouldn't recommend anyone to purchase this ceiling fan. This is so beautiful and exactly what I expected. It gives such elegance to our bedroom. "do you have it in 220 volts"
"How did others install the remote control box in the fan? Also, did it come with hang chains? Thank you"
It doesn't come with hang chains. the remote box didn't fit. I velcroed it to the ceiling. The remote is already installed. All you need to do is to have a professional do the wiring or installation of the fan. It does not come with chain. The control box fits very snugly in the top of the bracket that attaches to the ceiling wiring box. You do need to connect the wires at the sides of the bracket not down the center or the control box won't fit in the center hole next to the ceiling. "are the lights on the fan able to be dimmed?" The lights on this fan cannot be dimmed. "Can a 72 in. Down rod be ordered with this fan?" "Should this be able to turn on with the light switch or just the remote? We installed and it’s only working with the remote not the light switch when we enter our room?" It only works with the remote. "Can this be installed on a slanted ceiling? " It is not recommend or covered under the warranty, but an electrician can do it for the customer.